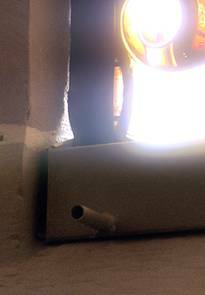 The accumulation of condensation on church windows is a completely normal structural-physical process. The church windows are (particularly in the cold season) the coldest point in this space; the dew point is undershot, the moisture in the air condenses in these places. 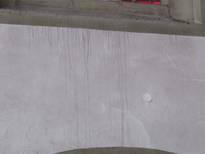 When large amounts of moisture converge at a given point – for instance, after a church renovation, because many litres of wall paint were used in the process (or if, during the rainy season, large-scale events with high attendance take place and the thoroughly wet guests introduce large amounts of moisture to this space, a particularly great deal of condensation accumulates. Therefore, any existing (or even new) chamfers must be checked and particularly diligently maintained by their users. These amounts of condensation should be caught by a condensation-collector chamfer / condensate chamfer to prevent their seepage into the masonry where they would either cause immediate damage there or run across the wall and cause damage there – or run off across the wall and damage the paint on the wall. Theoretically, the process goes that far. However, condensation-collector chamfers are not maintenance-free. If the prevailing amount of moisture is particularly large and the chamfer's capacity exhausted, it can (logically speaking) overflow. A runoff duct also dies not always prevent these adverse effects. On one hand, the runoff duct may become clogged by dust, insects, etc. ; on the other hand, in winter, the entire condensation-collector chamfer may freeze over. The chamfers are located within the building; however, they are usually made of copper and equipped with an exterior-facing flare. 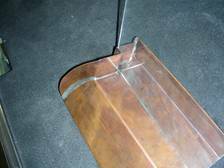 This flare acts as a cooling plate and allows the entire chamfer to cool off particularly quickly. Even the comparably-low temperatures on the interior in front of the window are not sufficient to prevent this process of excessive cooling. If a subsequent thaw sets in (and the condensation on the church windows ort he protective panes thaws accordingly), this thawing occurs significantly more rapidly than that of the ice block which has formed in the chamfer itself. The water dripping from this surface then runs across the ice block and down the walls. A solution to this problem: the tempering of the condensate chamfer. Via this process, the condensate chamfer can be kept free of ice and the runoff accordingly safeguarded. 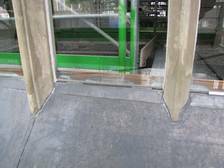 Yet of course, this solution still requires the maintenance of the chamfer with regard to prevention of clogging due to dirt accumulation. It also must be considered that (as a result of the warming process), more water from the chamfer evaporates and then more than ever activates the process of moisture circulation. Therefore, it is practical to draft an overall concept in co-operation with a veteran structural physicist. We will gladly arrange such contacts for you. In the file displayed on the right, you will find a depiction of the various channels via which water in the vicinity of a church window can make its way to the interior; furthermore, this process is not attributable to leakage in the stained-glass structures. We will gladly advise you as to the various options available for moisture control. 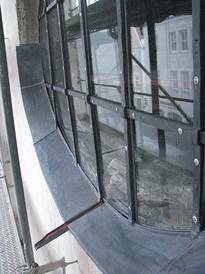 Illustration of a condensate chamfer made of copper and framed by lead on a window ledge covered with lead-sheet panelling. Illustration of a condensation-collector chamfer as an evaporation chamfer on a particularly geographically-exposed structure (which in any event would have been subject to the hazard of water being pressed into the interior due to the prevailing wind pressure). Illustration of a condensate chamfer made of copper; in this image, the exact adaptation to the masonry is readily recognisable. Logically, the assembly of a condensate-water chamfer is associated with a complete drainage and atmospheric-environment concept. In this process, all weak spots on the given structure should be considered. 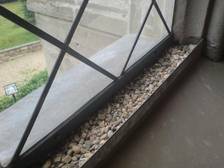 Here, this led to a comprehensive flashing of the window ledge, combined with a condensate chamfer featuring an exterior runoff fixture made of copper and framed by lead. The drainage of a condensate chamfer can also take place into the interior. This process often enables easier maintenance of the chamfers, and – following the removal of a stopper (see one already removed in this image), the condensation can be discharged by targeted means; with that, the circulation of water in the building can be halted. 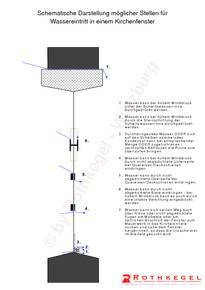 Schematische Darstellung von möglichen Wassereintrittsstellen an Kirchenfenstern. Nicht immer ist die tatsächliche Ursache, wie z.B. bei einer defekte Scheibe oder einem defekten Flügel, gleich erkennbar.